I recently purchased a bag of dried guajillo peppers from the grocery store with plans to use them for a recipe from my Bold and Healthy Flavors cookbook. Yesterday, I was having a major craving for salsa, but I wanted something a little different than just a basic salsa. I remembered the guajillo peppers in my pantry, and decided that I would give them a try. Guajillo, pronounced gwah-HEE-yoh, chile peppers are one of the most commonly used in Mexican cooking. They are a mild to moderately spicy pepper with a slight smokey flavor and berry tones. 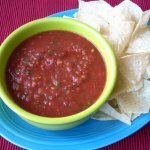 They add tremendous flavor to salsas, chile sauces, and soups. These peppers are also used in the North African condiment, harissa. The can of Herdez Salsa Casera says hot on the label, but this salsa is still very mild heat level wise. First, you will need to soak the dried chiles in some hot water to rehydrate them. Place the peppers in a bowl, and add enough boiling water to cover them You may need to use a saucer or small plate to keep them submerged. Let them soak for 30 minutes. Toward the end of the soaking period, start preparing the rest of the ingredients. Finely chop 2 tablespoons of white onion, and one small clove of garlic. Drain the guajillo peppers, and remove the stems. If you want a very mild salsa, open and remove the seeds. I left mine because I wanted a little bit of heat. 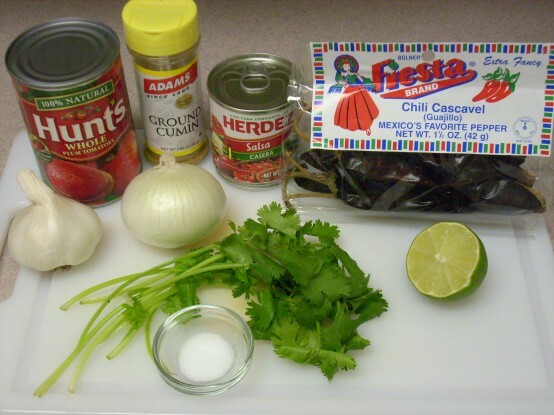 In a blender, add the can of whole tomatoes (juice and all), Herdez Salsa Casera, guajillo peppers, onion, garlic, fresh cilantro, lime juice, ground cumin, and salt. Puree until smooth. Refrigerate at least one hour before serving to allow the flavors a chance to combine. Place the dried guajillo peppers in a bowl, add enough boiling water to cover them, and let soak for 30 minutes. You may need to use a small plate or saucer to keep them submerged. Drain the peppers and remove the stems. If you want a very mild salsa, cut open and remove the seeds as well. Place all ingredients into a blender. Puree until smooth, scraping down the sides of the blender as needed. Refrigerate for at least one hour before serving to allow the flavors a chance to combine. Mmm. 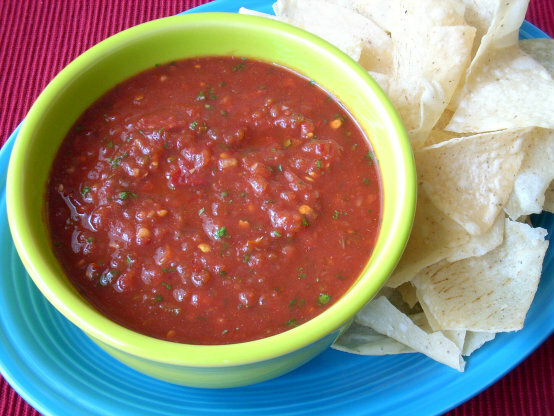 Love homemade salsa. Not sure I know what these peppers taste like but I am sure it was delicious. I love any kind of pepper. Thanks for the #ff this week!